Match North Korea overture with Iran offer, Germany tells U.S.
Germany welcomed U.S. Secretary of State Rex Tillerson's announcement that he was "probing" opportunities for dialogue with North Korea about its nuclear weapons program and called for Washington to take a similar step with Iran. North Korea's ambassador to Italy will be expelled from the country in protest over Pyongyang's recent nuclear and ballistic missile tests, Italian Foreign Minister Angelino Alfano was quoted on Sunday as saying. North Korea has shown no interest in pursuing talks on its nuclear and missile programs, the U.S. State Department said on Saturday after Secretary of State Rex Tillerson acknowledged the United States was communicating directly with Pyongyang. Several North Korean missiles were recently spotted moved from a rocket facility in the capital Pyongyang, South Korea's Korean Broadcasting System (KBS) reported late Friday amid speculation that the North was preparing to take more provocative actions. North Korea has been moving airplanes and boosting defenses on its east coast after the United States dispatched B-1B bombers to the Korean peninsula over the weekend, South Korea's Yonhap News Agency reported on Tuesday, citing the country's spy agency. Reacting to remarks by North Korea's foreign minister on Monday, China's U.N. Ambassador Liu Jieyi told Reuters the escalating rhetoric between North Korea and the United States was getting too dangerous and the only solution was negotiations. The Pentagon said on Monday that it would provide U.S. President Donald Trump with options to deal with North Korea if its provocations continue, after North Korea's foreign minister said his country reserved the right to shoot down U.S. bombers even if they are not in its air space. North Korea's foreign minister said on Monday that President Donald Trump had declared war on North Korea and that Pyongyang reserves the right to take countermeasures, including shooting down U.S. bombers even if they are not in its air space. China said on Monday that it hoped all sides would exercise restraint over North Korea, after U.S. President Donald Trump warned the North's foreign minister that he and leader Kim Jong Un "won't be around much longer". U.S. President Donald Trump dialed up the rhetoric against North Korea again at the weekend, warning the country's foreign minister that he and leader Kim Jong Un "won't be around much longer", as Pyongyang staged a major anti-U.S. rally. U.S. Treasury Secretary Steve Mnuchin on Sunday said President Donald Trump wants to avoid nuclear war with North Korea and "will do everything we can" to avoid conflict. North Korea’s Foreign Minister Ri Yong Ho told the United Nations on Saturday that U.S. President Donald Trump had made “our rockets' visit to the entire U.S. mainland inevitable” by calling North Korean leader Kim Jong Un "rocket man". U.S. Air Force B-1B Lancer bombers escorted by fighter jets flew in international airspace over waters east of North Korea on Saturday, in a show of force the Pentagon said demonstrated the range of military options available to President Donald Trump. China's Earthquake Administration said on Saturday that a small earthquake recorded earlier in the day in North Korea was not a nuclear explosion and had the characteristics of a natural tremor. 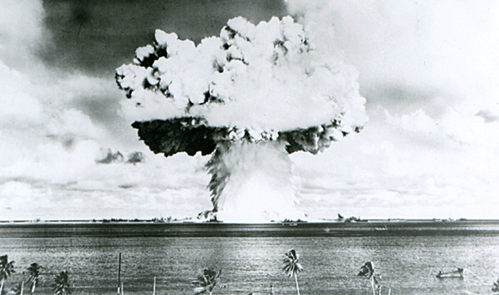 A look at nuclear explosive tests since 1945. The U.S. Navy carrier Ronald Reagan is conducting drills with Japanese warships in seas south of the Korean peninsula, Japan's military said on Friday, in a show of naval power as Pyongyang threatens further nuclear and missile tests. Detonating a nuclear-tipped missile over the Pacific Ocean would be a logical final step by North Korea to prove the success of its weapons programme but would be extremely provocative and carry huge risks, arms control experts said on Friday. North Korean leader Kim Jong Un blasted U.S. President Donald Trump as "mentally deranged" on Friday and vowed to make him pay dearly for threatening to destroy his country, hours after Trump ordered fresh sanctions over Pyongyang's weapons programs. Japan's Chief Cabinet Secretary Yoshihide Suga said on Friday that North Korea's remarks and behavior were "absolutely unacceptable" and provocative to regional and international security. North Korean Foreign Minister Ri Yong Ho said on Friday he believes the North could consider a hydrogen bomb test on the Pacific Ocean of an unprecedented scale, South Korea's Yonhap news agency reported. Soon after North Korea tested its sixth and largest nuclear bomb earlier this month, You Jae-youn, a 32-year-old South Korean office worker, swiftly put the news behind her to focus on more immediate worries. The pursuit of nuclear weapons will not bring security for North Korea's government and China's assistance is vital to bringing Pyongyang's atomic and missile programs under control, U.S. Secretary of State Rex Tillerson said on Thursday. U.S. Treasury Secretary Steven Mnuchin said on Thursday that banks doing business in North Korea would not be allowed to also operate in the United States under a new sanctions order aimed at thwarting Pyongyang's nuclear and missiles program. China's central bank has told banks to strictly implement United Nations sanctions against North Korea, four sources told Reuters, amid U.S. concerns that Beijing has not been tough enough over Pyongyang's repeated nuclear tests. EU ambassadors have reached an initial agreement to impose more economic sanctions on North Korea, going beyond the latest round of UN measures, officials and diplomats said on Thursday. U.S. President Donald Trump said on Thursday he had signed an executive order that would allow the United States to ramp up sanctions on North Korean firms in an effort to dissuade Pyongyang from pursuing its nuclear missile program. Chinese Foreign Minister Wang Yi reiterated to his South Korean counterpart Beijing's demand for the removal of the Terminal High Altitude Area Defense (THAAD) anti-missile system, state news agency Xinhua said on Thursday.